Whether you're looking for inspiration to start your own project or simply want to take a look inside a renovated property to see what's possible, you're almost sure to love Amy and Philip Matthews' sensitive renovation of their Grade II-listed Georgian home. Looking for even more inspiration? Browse more of our gorgeous real home transformations... Read our guide on renovating a house, too, for more guidance. 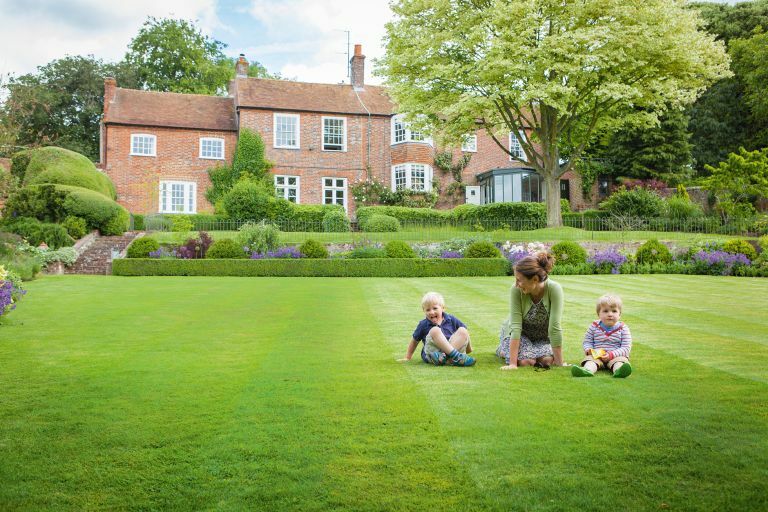 Childhood memories of wonderful summers spent outdoors, in the heart of the beautiful rolling Chiltern countryside, prompted Amy Matthews to leave London behind and head to Oxfordshire with her husband Philip to start their hunt for a new family home. The couple had lived in the capital for a decade, but their property search took on a renewed sense of urgency with the arrival of their first child. With family close by, and easy access to London and Oxford, the Chilterns proved irresistible. Amy and Philip fell for the characterful, rambling Georgian house immediately. It had a beautiful village setting, its façade was framed by climbing roses and box trees, and the interior was full of original features. Amy took inspiration from the era of the house when designing this space, with antique tall drawers that once belonged to her parents positioned next to the room’s original fireplace. The couple’s art collection also influenced the scheme – the artwork in this room was bought from the London Original Print Fair at the Royal Academy and at auction. Lassco supplied the glass coffee table, and the tall lamp is from Vaughan Designs. In designing her new home, Amy took her inspiration from the character of the property itself. ‘The architectural detail is charming. It’s a house that’s full of surprises — there are all sorts of old doors and panelling, beautiful original ironmongery, quirky little bookshelves, and plenty of nooks and crannies. It’s also very higgledy-piggledy, with steps everywhere, leading to different levels,’ she says. ‘We were determined to keep as many period features as possible and maintain the integrity of the building, so I considered each room individually. ‘It’s an intriguing house architecturally, too, as it was once two separate buildings,’ she continues. The main house was built in the early-18th century and a link to the neighbouring cottage was added in Victorian times. The property evolved further, with 20th-century additions including a conservatory, which houses the kitchen and dining room, and a pergola. The blue chair from The French House has been covered in fabric by Dominique Kieffer for Rubelli. Interior designer Amy was well equipped to add to the charm of the house. Her mix of vintage, antique and contemporary pieces, along with the elegant proportions and abundance of light within the house, has created a graceful family home. ‘My mother calls it eclectic,’ she says, ‘but, by and large, we’ve stayed traditional — I like furniture and detail that are contemporary to the original house’. A combination of floral fabrics, including curtains from Sanderson, and the striped wallpaper from Colefax & Fowler lend a vintage feel to this light-filled room. The house also has a more formal drawing room, in the Victorian link. It is a beautifully proportioned room with large French windows, and the couple love to host parties in here, where guests can spill out onto the terrace. ‘It’s cosy and friendly — the whole house has that feeling as soon as you walk in: a warm and welcoming vibe,’ says Amy. Wisely, Amy and Philip have done little to change the timeless exterior appearance of their village home. With just under an acre of land to the rear of the property, the garden sweeps down from the house, which is perched on a small hill. With most of the work out of the way, Amy and Philip’s future plans for the house include a full kitchen remodel. ‘The painted units were inherited from the previous owners. We have made a few minimal changes, such as replacing the flooring, but we are living with it for now as we plan to renovate it eventually,’ says Amy. Following a very hectic few years, Amy has recently returned to work as an interior designer. So is her own design project now complete? ‘I see a house as an ongoing process’, she says. ‘I don’t think it’s ever completely finished — there is always something to add or take away, as well as tweaking and refining to be done.